This entry was posted in British Paintings, Fine Art, Visual Arts and tagged arts, Ruislip, St Andrew, Visual Arts, Wellers. How wonderful to see a painting by Norman Blamey posted on the internet! – thank you! He was a superb artist, whose contributions to the RA Summer Show always fascinated me. He was also an excellent teacher at the RA Schools. It was wonderful to watch him draw in his sketchbook as he explained a point. Years after leaving that establishment, I cheekily sent him a letter asking a technical question, and he was generous enough to send me a detailed 2 page reply. A quick postscript to my previous comment. The painting illustrated was possibly painted circa 1964. and shows evident elongation of form. Later on his forms were based more on objective proportions, and for me those were his most successful paintings. I wonder what others think? There is a wonderful catalogue of an exhibition held in Norwich, Bath and The Fine Art Society in 1992/3. 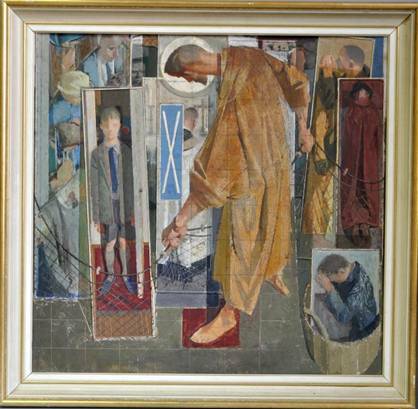 Yes, I am fascinated too, exploring the magnificent work of Norman Blamey!!! Don’t you agree Peter Burgess, that the recognìtion came too late? I agree with you on your comments concerning his personal style. Yes indeed Julia, thank you for your comment. I believe he did have a fair degree of recognition from other artists, and is in the Tate Gallery collection amongst others, but the wider public have almost certainly never heard of him! A shame, his commissioned portraits are outstanding. Delighted that you enjoyed seeing the painting. It has caused a lot of well-deserved interest.